Cowan's Cleveland Market Winter Live Salesroom Auction includes a fine selection of silver, furniture, paintings, sculpture, lighting and more. Highlights of the sale include Howard Chandler Christy's Madonna of the Trail (lot 85) a wonderful large scale oil painting celebrating the Pioneer Spirit of America. 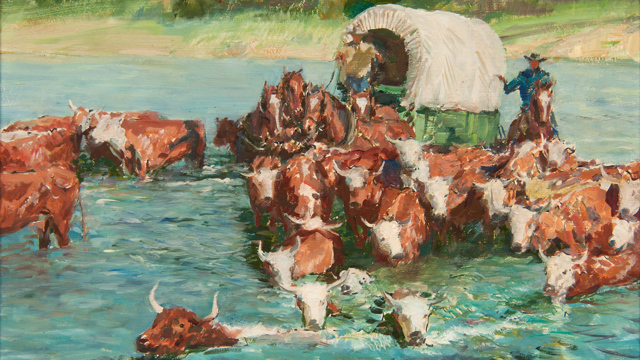 Additionally, to be offered are many pieces of western-themed art from the Estate of Suzanne Rickards including paintings by Donald Teague and an Olaf Wieghorst bronze. Of local interest are two sporting paintings by Clyde Singer and a beautiful Madonna and Child ceramic by R. Guy Cowan.